Win a masterpiece of prizes when you enjoy a beautifully designed game of “DaVincis Diamond” slots. It is a five reel and twenty payline game that is full of bonus features and winning opportunities which include several scatter and wild icons as well as free spins. The coin values vary from as little as one penny to five dollars each. This means it can be a very low-risk experience or even a high stakes venture as well. The fine art theme of the game is depicted through such gorgeous icons as the Mona Lisa, various gems and jewels, and accurate reproductions of some of DaVinci’s most famous paintings. The wild symbol for the “DaVincis Diamond” slots is the signature “wild” icon. It will substitute for all other symbols except the various scatters in order to complete a winning combination. 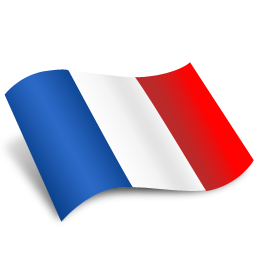 The symbols must fall along the active payline to count towards the completion, however. There are three different scatter symbols in this game, each being a good reproduction of a lovely DaVinci female portrait. These too complete winning combinations along the reels, but they don’t have to actually strike the payline to count towards the win. They do, however, have to appear at least three or more times at any location on the screen. Payouts for these scatters will depend upon the entire number received, which then delivers a multiplier to the original wager. 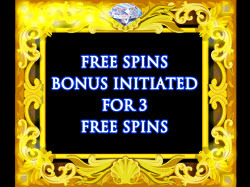 There is a special “bonus” symbol for this game and when a player receives three or more they are taken into the six free spins round. During this time there are several regular symbols converted to scatters, and these allow the player to take many more prizes than during normal play. The symbols include the double diamonds, pearl, teardrop, sapphire and yellow stone, and when three or more appear on the reels the player receives the appropriate payout. All prize payouts for the “DaVincis Diamond” slots game depend upon the total number of matching symbols that hit the active paylines. When it is five symbols the prizes are five thousand coins in the amount wagered for the logo image, one thousand for the Mona Lisa, five hundred for the DaVinci self-portrait, three hundred for the Lady with the Ermine, one hundred for the ruby or the emerald, and eighty for the amber. 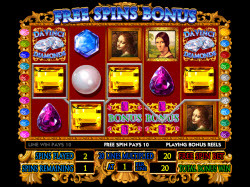 When it is four symbols that strike the active payline the player receives five hundred coins in the amount wagered for the logo image, two hundred for the Mona Lisa, eighty for the DaVinci self-portrait, sixty for the Lady with the Ermine, thirty for the ruby or the emerald, and twenty for the amber. 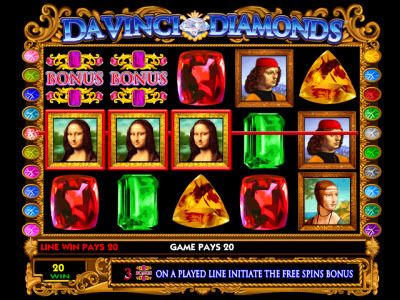 Finally, when it is three symbols along the active payline the payouts are one hundred coins in the amount wagered for the logo image, fifty for the Mona Lisa, thirty for the DaVinci self-portrait, twenty for the Lady with the Ermine, and ten coins apiece for either the ruby, the emerald or for the amber gems.